At AC Transit we’re committed to providing safe, efficient and reliable bus service to the riders who depend on us every day. The District established a long-term plan in 2011 to anticipate increasing costs and schedule periodic fare adjustments. 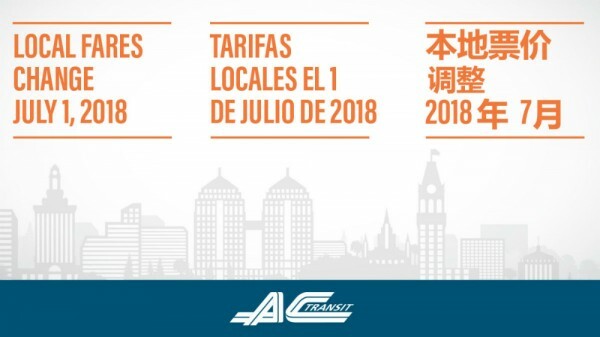 As a result, AC Transit will adjust the cost of local fares and passes on Sunday, July 1, 2018. Cash fare for a local adult single ride will increase by ten cents to $2.35. The new cost for the Local Adult 31-Day pass is $84.60. Adult Day Pass prices remain unchanged at $5.00. Senior, Youth and Disabled fare and pass increases are described on our Fares & Clipper page. Call us at (510) 891-4777 for more details about fares, passes, discounts, and transfers. Leave the worry of exact change behind and travel with the ease of a pre-loaded Clipper card. A 31-Day pass on Clipper offers the best value of unlimited rides on all local AC Transit lines. Does your trip require two or more AC Transit buses? The affordable answer is a Day Pass, offering unlimited rides for one flat fare, $5.00. Not a daily rider? Load value and tag your Clipper card to receive a discount on local single ride fares. Purchase Adult Clipper cards and most AC Transit passes at Walgreens, Whole Foods and other participating retailers. You can also load cash value at all BART stations. Visit clippercard.com or call (877) 878-8883 for more information.